It has long been understood that when trying to lower cholesterol genetics make it easy for some and difficult for others. That is because the two main factors that contribute to how your body manufactures and stores cholesterol are family history and diet. You can control your diet by eating a low cholesterol, low fat menu, but you can’t help your genetic make up. Scientists are now able to explain why some people are genetically disposed to having high cholesterol, no matter how well they eat. Researchers working together from Yale and Syracuse Universities have been able to find a direct link between a mutation in mitochondrial DNA and high cholesterol and high blood pressure. What was not known until recently was the connection between these mutations and the risk for high cholesterol. Metabolic syndrome, which is defined loosely as having several risk factors for heart disease – 5 or more, may be caused by the malfunctioning of mitochondrial DNA. If you have high blood pressure, high cholesterol, and diabetes, are obese, AND have high triglycerides, then you have metabolic syndrome. To make the connection between genetics and mitochondrial mutation, four generations of the same family were evaluated which included 142 people. The findings were that the mutations did not cause all of the individuals in the family to have the same symptoms. Understanding that mitochondrial DNA mutation has a direct impact on cholesterol levels gives nutritionist and doctors one more fact to use in helping people lower cholesterol. If one family member has high blood pressure and triglycerides because of the mutation, then they are perhaps at greater risk for high cholesterol and can take action now to prevent it from causing irreversible damage to their arteries. To lower cholesterol naturally, without prescription drugs, and to keep your cholesterol levels in check even if you have a family history you can begin with the right diet and exercise. 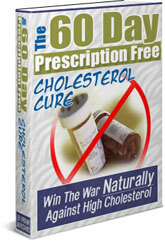 The plan is described in detail in The 60-Day Prescription Free Cholesterol Cure by Frank Mangano.